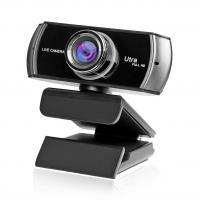 Do you want superior quality images from your webcam? Don't settle for just any webcam. This camera offers a high-definition 1536P (higher than many monitors are capable of displaying) image as well as excellent 1080P (1920x1080) video out of its 7 element optical glass lens. Getting setup is easy. Just plug it into any 2.0 or greater USB port and start streaming. As the camera is designed around the USB Video Class (UVC) standard any recent operating system will work out of the box as there is no need to install a driver. The webcam can also be directly used with most third party software. Compatible With Microsoft Windows 7, 8, 10 and above as well as Mac OS 10.6 and above. Chrome OS, Smart TV, and TV BOX Android 5.0 or later. Most other recently released distributions are also compatible.